I cannot believe it; my bloat has finally receded! I just looked in the mirror and I don't look nearly as pregnant as I did last night. I am eagerly awaiting the real baby bump now. I am so excited to look pregnant! For the ladies who have been (or are) pregnant, when did you first start to show? 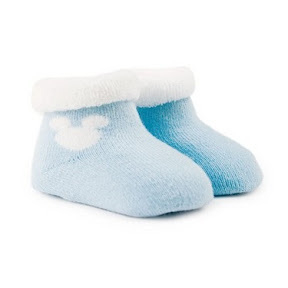 I hate to plug Totsy.com again since I just did last night, but right now they have some of the cutest Disney booties, tights, and socks I have ever seen for 50% off. The retailer is Trumpette. I went a little credit card happy and bought quite a few things for our little one's feet. They are seven dwarves socks! 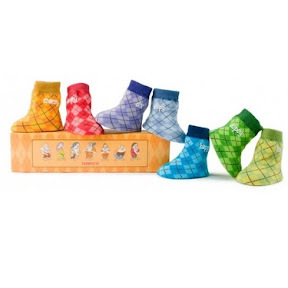 Each adorable argyle pair has the name of one of the dwarfs on them. Help me! These flash sales are going to be the death of my bank account. Don't forget the coupon code in last night's post if you are interested in ordering any of the cuteness. Oh how I want to buy those socks! Those are adorable! I showed at 14 weeks with Conor, but didn't feel like i actually LOOKED pregnant until like a month or 2 later. With Riley, i was in maternity pants at 10 weeks, and had popped by 16. and thanks for all the tips on the websites, those are some awesome sales!! :) When do you find out what you're having again? You are going to find out, right? Hi! How are you feeling? Recovering well? Yes we are going to find out what we're having, not sure of the date yet, though. I'm planning on shooting my doc an e-mail this weekend to ask when we should schedule the ultrasound. I think it will be mid-late August! holy flippin' cute. I love argyle!